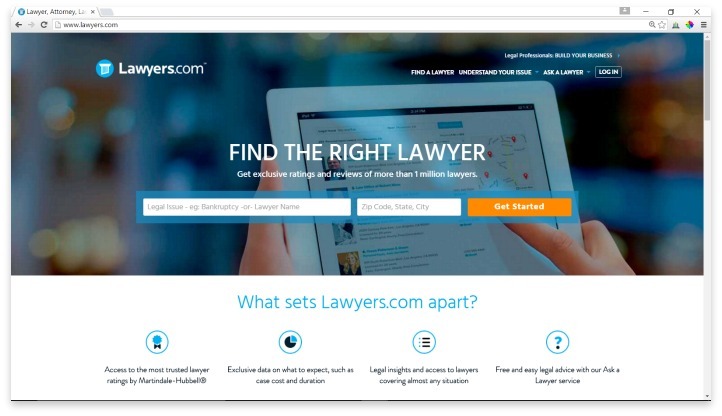 Lawyers.com is a free website that provides individuals and small businesses with user-reviewed profiles for lawyers and law firms around the world. This website is a service from Martindale-Hubbell, a legal information services company that was founded in the 1860s. Martindale-Hubbell has been publishing a directory of lawyers’ background information since 1868, and has now turned their knowledge into a free online database at Lawyers.com. Lawyers.com could almost be considered a combination of LinkedIn and Angie’s List for lawyers. For clients who need legal counsel, this website provides thousands of profiles that show a law firm’s or a specific attorney’s experience, education, and notable areas of expertise. The website also has a huge database of legal information, helping users find answers to questions that they have about the legal process, and helping them discover what areas of expertise they need to be searching for in their specific case. This is achieved through a user friendly page that helps users choose from the most common types of needs – however, there is no simple process by which users can enter their needs and find out exactly what they should be looking for, which is a service that many of Lawyers.com’s competitors offer. Lawyers.com does host legal forums, where clients and legal professionals gather to help each other further. They also have a feature called “Ask a Lawyer”, which includes a searchable database of previous answers given to legal questions asked via the website. These are answered by licensed, professional attorneys, all of whom are featured on the website so that you can easily see their credentials. The entire website is free for users to search, browse, and sign up with. For lawyers, basic accounts appear to be free to create, with certain types of posts and features costing extra fees along the way. Making a simple profile acts as an advertisement that can lead browsing clients to contact you if they like your profile. Clients browse based on area of law and location, so its important that you are clear about what areas of law you have expertise or experience in to lead to the most relevant contact. Because Lawyers.com is operated by one of the oldest legal information services in the United States, it is seen as a reputable website, and that reputation can reflect well on your own law firm by being present within the database. User reviews also present another challenge for lawyers who wish to be included in the database; it’s unclear how Lawyers.com handles moderation on reviews and comments, and there has been some question about the integrity of the review system in third-party reviews of the website itself. If you are concerned about the quality of user reviews left on your Lawyers.com profile, it may be best to get involved with the forum to show that you are willing to offer great customer service. Lawyers.com is a free website that provides individuals and small businesses with user-reviewed profiles for lawyers and law firms around the world. Overall, Lawyers.com is a good place to begin your hunt for a lawyer, especially if your need is more general. If you want to search through the largest group of pre-screened lawyers in an area, and you have no other criteria in mind just yet, Lawyers.com offers you a free database to do just that. But you won’t find the extra screening and legwork services offered by similar sites, so be prepared to do some research once you’ve narrowed it down. Have you had an experience with this company? Please share your Lawyers.com reviews below. Lawyers.com uses Martindale-Hubbell ratings which have been around forever and have a great reputation for being honest. You can tell because everyone who appears at the top of the searches don’t have perfect scores like they do on other sites. I also think it’s cool that they have ratings from other lawyers and from clients. I’ve used them for years and they used to be real expensive but their costs have gone down. They seem to update their site a lot now and the website that I have with them works great! + PROS: Reviews and ratings seem to be real and honest and I like that they have them by other attorneys and clients. Listings are well organized. - CONS: Wish some of the lawyers listed more information.